Travel to an Indonesian rainforest and let the Goddess of Wealth and Prosperity guide to you untold riches in the latest slot release from Quickspin. Get ready for a magical adventure as you are transported to a tropical rainforest in Indonesia where you'll get the opportunity to meet a Goddess of Wealth and Prosperity. She will have the power to grant lucrative rewards and an abundance of cash prizes while you spin the reels on this exceptional new slot from Quickspin called Divine Dreams. Players will also be pleased to know that the slot can be enjoyed on both desktop and mobile devices for added convenience. 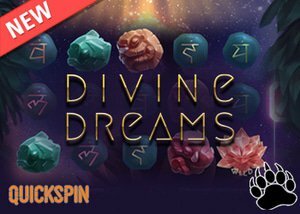 The new Divine Dreams slot from Quickspin online casino software comes equipped with a standard 5x3 reel structure and boasts with 243 Ways to Win which means you merely need to land a minimum of three symbols on successive reels to receive a payout. What's even more impressive is that the slot offers a tremendous selection of bonus features like Divine Free Spins, Mega Respins, Ying Yang Wilds, Mystical Multipliers, and a Bonus Reel along with a top jackpot prize worth 7,500 times your total bet. The pink lotus flower will be your wild symbol, substituting for all regular symbols to form a win. However, it will not stand in for the scatter symbol on the reels. Please also keep in mind that the lotus wild symbol will only appear on reels 2, 3, 4, and 5 to help form winning combinations. Located on the right-hand side of the 5x3 reel structure is a bonus reel. The bonus reel will spin every time the reels are set in motion and when it stops, you will have the chance to win multipliers of up to 10 times your total win amount, or a Sacred Respins feature when the bonus reel stops on a Super Respins field. During the Super Respin feature, multipliers will be increased up to 20 times and you will receive at least 1 additional wild symbol. Should the bonus reel display a Mega Respin field during the Super Respin feature, the multipliers will be increased up to 30 times and more wilds will be added onto the reel set. The bonus reel also has the power to reward you with Yin Yang wilds and once this is activated, you will receive two wild symbols in random symbol positions along with a random multiplier to further increase your winning potential. The golden goddess will represent the scatter symbol on the reel set and you will need to display at least 3 golden goddess scatters to unlock the Divine free spin feature. Displaying 3, 4, or 5 Golden goddess scatters will award you with 8, 12, or 20 free spins, respectively. During the Divine free spin feature, additional wilds will be added to the reels, while the Sacred Respins feature can be activated more often. In addition, the Ying Yang wilds will appear more frequently on the bonus reel and a new field will be added on the bonus reel which can award 3 additional free spins during the free spin feature. The new Divine Dreams slot from Quickspin boasts with a tranquil and peaceful atmosphere in the heart of an Indonesian rainforest. You will be greeted by an assortment of beautifully crafted stone symbols to complement the theme of the game, including a pink pig, rewarding the highest payout of 1,500 coins, an orange tiger, a yellow monkey, a green turtle, and a bluefish. You will also find 5 unique runes forming the lower-valued symbols on the reels, each presented with a unique carving in various vibrant colours. Quickspin's Divine Dreams slot also comes equipped with a wide variety of betting options to ensure both veteran and beginner can enjoy the slot, regardless of their pocket size. The new Divine Dre3ams slot offers 16 different bet values, ranging from a minimum of $0.20 a spin up to a maximum of $100 a spin. Although it doesn't feature any adjustable reels, there is more than enough flexibility in terms of betting options. The new Divine Dreams slot is considered a high volatility game, boasting with a payout ratio of 96.51%. The slot made its debut at all Quickspin casinos in January 2019 and we recommend that you play the new Divine Dreams slot at Casumo Casino where you'll be treated to a 100% match up to $500 on your first deposit of $20 or more and 100 free spins on the popular Book of Dead slot.